How do you study a moving wall of water and sediment the size of a truck traveling at 30 kilometers per hour? A paper about a spectacular Ocean Networks Canada (ONC) dataset was recently selected as one of science journal Sedimentology’s Top 10 articles of 2016, as an example showcasing “good practice, innovative approaches, and noteworthy advances of our science.” Congratulations to marine geoscientist Gwyn Lintern (Figure 1) and colleagues from Natural Resources Canada who published this paper on the tumbling delta dynamics laboratory platform. Figure 1. A man outstanding in his field: Natural Resources Canada marine geoscientist Gwyn Lintern. The Fraser River delta is known for its dynamic nature: laden with thick sediment deposited on its journey from source to sea, underwater landslides occur regularly, particularly during the spring freshet season when glacier snowmelt and spring runoff dramatically quickens and thickens the river flow. In 2008, ONC installed the delta dynamics laboratory in the mouth of the river delta (Figure 2) to capture the dynamics of these events. Figure 2. The delta dynamics laboratory is deployed at the mouth of the Fraser River delta, facing upslope to monitor and measure the full force of seasonal turbidity events. In 2012, a strong underwater landslide⎯known as a turbidity current⎯took hold of the one-tonne delta dynamics laboratory platform, and no-one anticipated what would happen next. The sediment-rich torrent of fast-moving water grabbed the platform, turned it over several times, and deposited it 75 metres down the slope. The Internet-connected instrument recorded three platform rolls before the cable connection broke, about 30 seconds into the event. 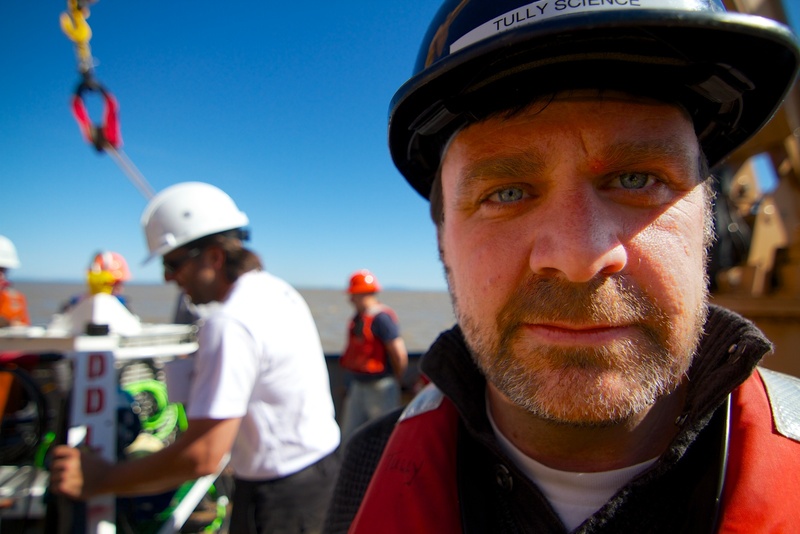 Thanks to ONC’s real-time cabled connection, project lead Gwyn Lintern was aware of the tumbling event the moment it happened; this allowed him to promptly launch a follow-up expedition to investigate the area and take sediment samples. Figure 3. The damaged delta dynamics laboratory platform being recovered and inspected following its dramatic tumbling event during the spring tide freshet. Despite losing an instrument platform (Figure 3), Lintern was excited to see the last recorded data (Figure 4). While the platform was tumbling and rolling⎯but still connected⎯it presented an unexpected opportunity to sample a range of water depth zones at various orientations within this turbidity current. The result was a valuable set of profiles of sediment concentrations and water velocity, data that are essential to understanding the nature of these complex events. Figure 4. The final minutes of data from the delta dynamics laboratory platform, 5 June 2012. Analysing scientific data is a painstaking process. It took Lintern and his team several years to analyze the data so that the results could be published, but based on the positive reviews about the merit of this study, the wait was well worth it. Details of the turbidity current’s dimensions (one to four metres high) and speed (six to nine metres per second), which is the equivalent of a large truck travelling at 21-32 kilometers per hour. An understanding that the Fraser River delta’s turbidity currents are strong enough to tumble a one-tonne platform. Evidence that this dynamic turbidity current did not significantly change the shape of the seafloor. Indications that the conditions that trigger large turbidity currents (such as spring tides during the freshet) are now somewhat predictable. In fact, on the same day three years later, a re-designed platform (Figure 5) slid again during a turbidity event, but this time without tumbling, and it remained connected. Figure 5. During the 2015 spring tide freshet, the redesigned delta dynamics laboratory platform slid downslope without tumbling or being disconnected. Ultimately, with these significant findings and positive paper reviews, it did not come as a total surprise to learn that this paper was selected as one of Sedimentology’s top 10 articles. Read the Sedimentology article: "Powerful unconfined turbidity current captured by cabled observatory on the Fraser River delta slope, British Columbia, Canada" by D.G. Lintern, P.R. Hill and C. Stacey, published in 2016; DOI: 10.1111/sed.12262. Lintern is continuing his studies in this area (Figure 6). Figure 6. In October 2016, a newly redesigned delta dynamics laboratory platform was deployed. It is one of the largest platforms on ONC’s coastal network, weighing two tonnes and measuring six meters in length. Its extended leg posts anchor the platform 0.5 metres into the seabed, and it is equipped with over a dozen sonars intended to provide a fuller picture of turbidity events. During Expedition 2017: Wiring the Abyss, the delta dynamics laboratory platform will receive its annual maintenance and upgrades. This Strait of Georgia location will also become the new home for an innovative field experiment to study fish behaviour through sound and imaging.